Synthetic shake and shingles are polymer-based material, or a combination of plastic and rubber. They are used on roofs where homeowners desire the classic look of wood or natural slate, with the added benefits from the synthetic blends. Synthetic roofs are relatively new to the residential roofing market, first arriving in the early 1990’s. Their durability, environmental friendliness and affordability have all contributed to their rising success. For an average 2,300 sq.ft., non-complex, single-story roof, it will cost between $5.50 and $8.50 per sq.ft. installed. This results in an average total price range of $12,500 to $19,500. If the existing roof needs to be torn off first, this can cost $2,250 to $3,500 more. A complex roof with multiple angles, dormers, and valleys, or greater pitch would add to labor charges. Composite shingles and fake composite slate cost virtually the same. Formation is done via a molding process to ensure it resembles wood or stone, as the case may be. The material is fairly light at about 1.25 pounds per tile, so essentially all roof types can handle such installation. The tiles can easily be cut on-site with a utility knife and are attached as simply as using a nail gun. An asphalt shingle roofer ought to have the skills to properly install synthetic shake and shingle roofing. With any home improvement project being handled by qualified professionals, it is in your best interest to get more than one quote, or preferably between three and seven. The quoted figures they give you will either be total installation charges (one price for everything) or they’ll ideally itemize each cost so you can better compare their rates to the competition. For the example below, we ballpark certain figures as particular items, like building permits and disposal fees vary by region. 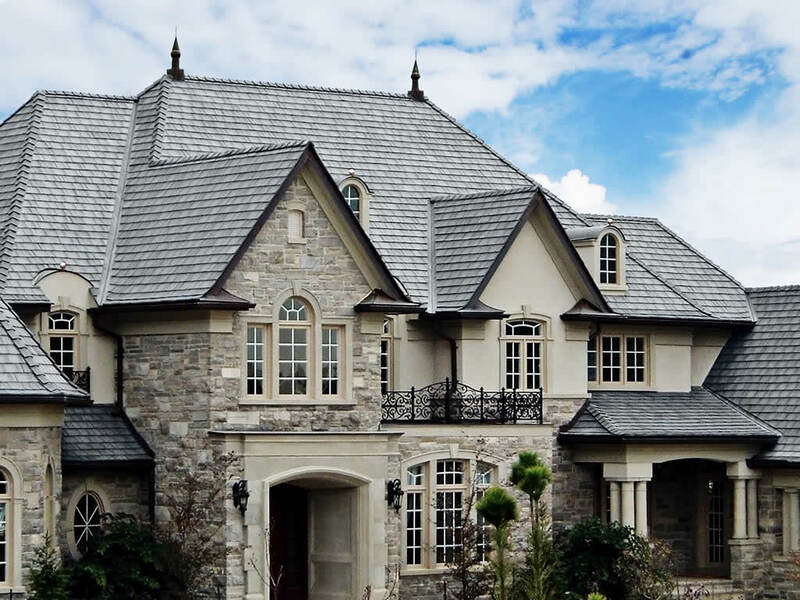 While material costs are roughly the same between composite shingles and fake slate, the material costs will be based on manufacturer and distributor pricing. DaVinci Roofscapes makes synthetic slate, also known as fake slate. Enviroshake also produces synthetic shake (though crosses over into other types, despite their brand name). Variation may occur, from brand to brand, in the length of tiles. Though the costs remain fairly uniform. With shingles, color tends to mimic natural wood, though special ordering a specific color can be had at a premium. With the “fake” slate, multiple color options do exist, and do not affect cost. Tearing off a previous roof is a rather substantial cost, but in many cases probably unnecessary. Synthetic tiles can be nailed right on top of existing asphalt shingles, and assuming your roof deck is in good shape, this means you can eliminate the tear-off and removal expense, which in our above example equals 18% of the charges. Roof Layout again adds to the labor cost. The height of your roof from the ground, along with height of the peak from the lowest edge of the roof, all translate into timing considerations for professionals. Slope of the roof is generally a determining factor, with steeper inclines costing more. Synthetic tiles are all designed for roofs with a slope factor of 3:12 or steeper. Finally, there’s the factor of the labor charges. The manufacturer websites (above) usually have a “find a contractor” option to aid you in your search, and to ensure their product is done by a certified and experienced professional. In other words, it makes their product look better when it’s done right. However, this material is on the easier side of roofing installation and cost savings could conceivably come from a local roofer who is established and able to back up, via warranty, their work. With a lighter material that is relatively easy to install may come the misconception that it is not very durable. The opposite is in fact the case. Usually, warranties for the material are 50 years or more. It’s built to last as long as natural slate while costing about one third the price of the natural material. It’s also not fragile, which natural slate cannot say. With natural slate, walking on it, unless you know what you’re doing can lead to significant problems. With fake slate, you can march on it, and it won’t adversely affect the installation. Another positive with the durability is your return on investment, or ROI. EnviroShake estimates a 70 to 80 percent ROI with their products. To top it off, the synthetic material is recyclable. Some of the manufacturers will use material that’s non-recycled, while others use high quality recycled material. The synthetic material from the curb closely resembles natural wood and slate, but up close it is possible to tell the difference from the natural product. However, it is virtually impossible to tell the difference between non-recycled and recycled synthetic material. It being a relatively new material, it doesn’t have the track record of it’s natural counter part, though its advantages possibly outweigh this concern. The key disadvantage is that warranties aren’t truly established (yet). Colors are blended throughout the material and believed to last a long time (many decades) before they fade. Or when they do fade, will do so uniformly. Though again, with only 25 years of field testing, the facts on this are truly to be determined.